Durable finish on top helps resist damage. Full-suspension file drawer. Grommets for cable management. Modesty panel provides privacy. Flush drawer pulls. Not freestanding. Desk and Return sold and shipped separately?ORDER BOTH. 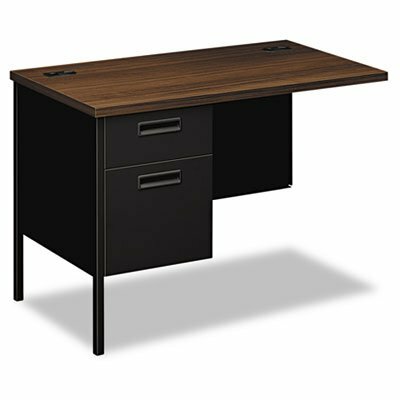 Color: Columbian Walnut/Black; Pedestal Count: 1; Drawer Configuration: Left: Box/File; Overall Width: 42". Not freestanding. Desk and Return sold and shipped separatelyORDER BOTH.